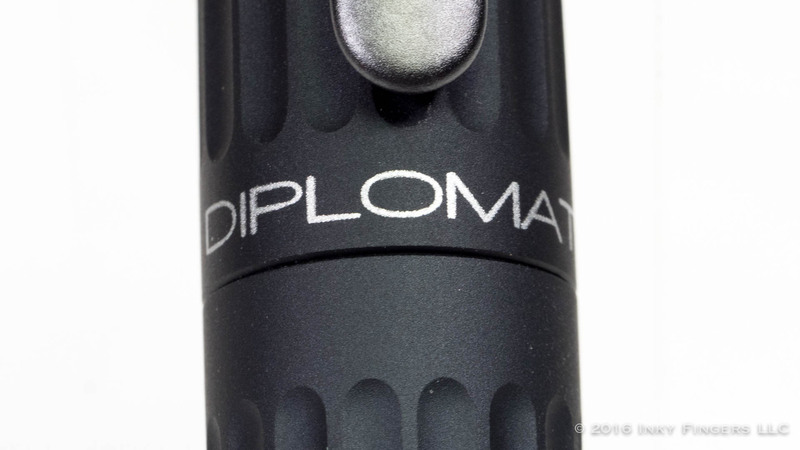 This pen was provided free of charge by Points of Distinction, the US distributor for Diplomat pens, in exchange for an honest review. No additional compensation was provided. 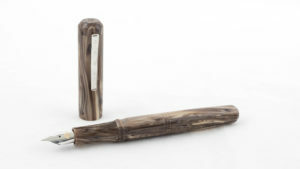 In keeping with the Pen Habit Review Code of Ethics, this pen will be given away on The Pen Habit in a future blog post. I love The Simpsons. I’ve watched every episode of the first 15 seasons at least a dozen times. It’s a real struggle for me not to infuse every single one of my reviews with dozens and dozens of quotes from the show. So, if you’ll allow me to give into my baser instincts, I’d like to paraphrase a Simpsons quote. 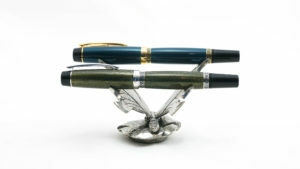 The fountain pen hobby lets me feel like Christopher Columbus: I discovered something millions of people did before me. 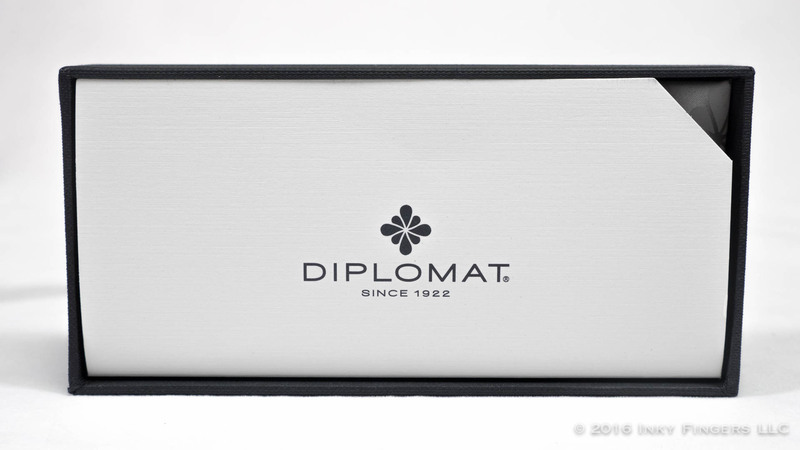 They provided me with one of their show offerings, the Diplomat Aero, for review purposes along with a bottle of Diplomat blue ink. 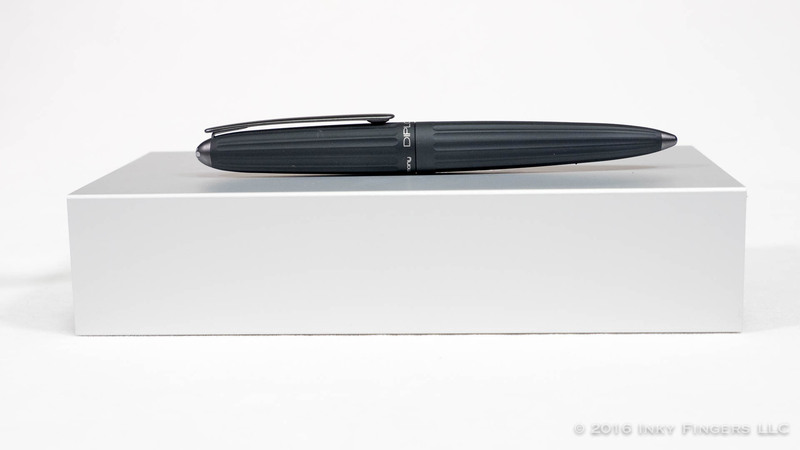 The appropriately-named Aero is a beautiful, anodized aluminum pen shaped much like a zeppelin of old. 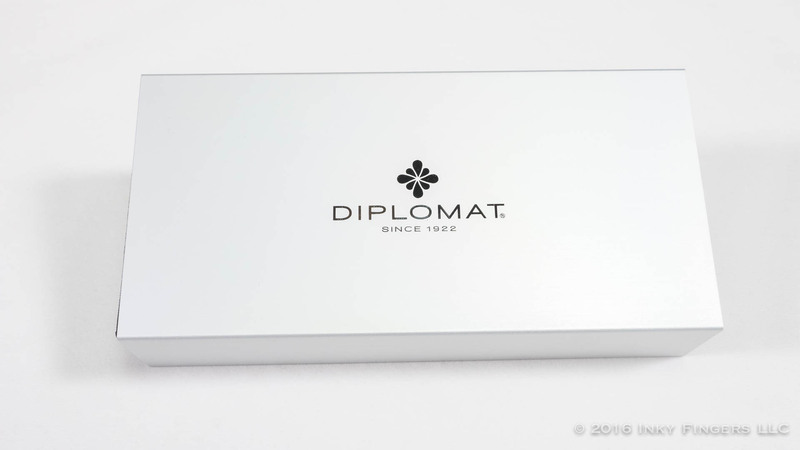 When capped, the pen starts with a rounded point onto which the diplomat logo has been stamped in white. The ridged body swells toward the center, then tapers back down to another point at the end. 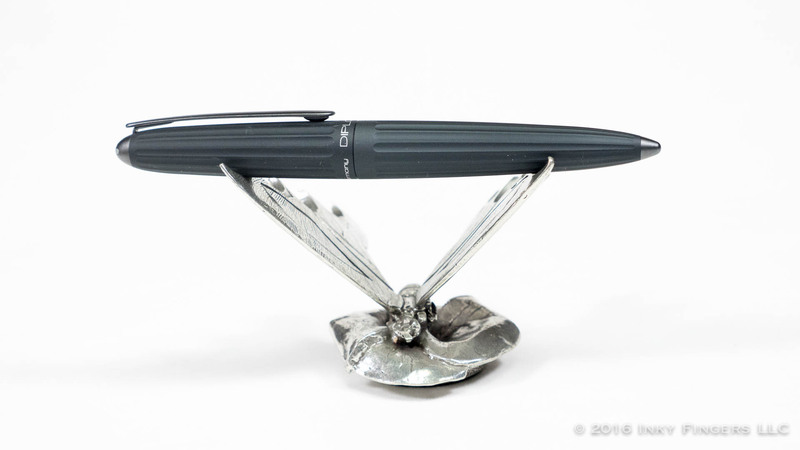 It is a graceful, and somewhat unusual shape, but one that I find eye-catching. 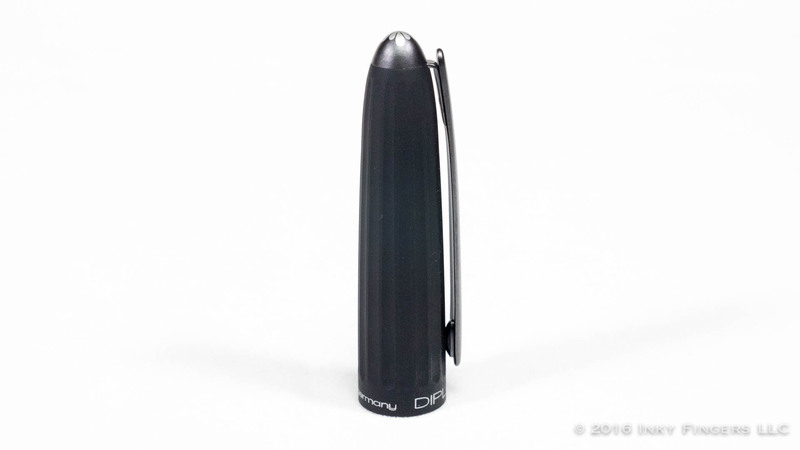 The pointed ends and the springy clip are offset by a lighter, satin-like anodization. The cap features a modern white font. 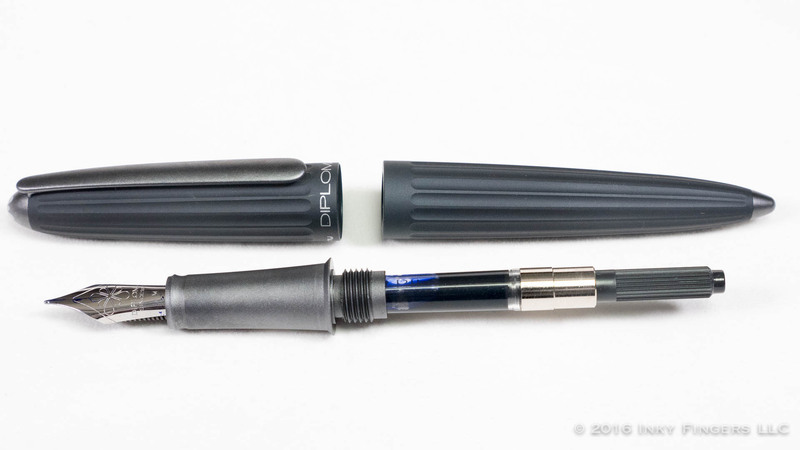 The cap pulls off to reveal a matte anodized section that matches the clip and pointed ends. The texture of the section has a lovely non-slip feel which completely overrides my general dislike of metal section. 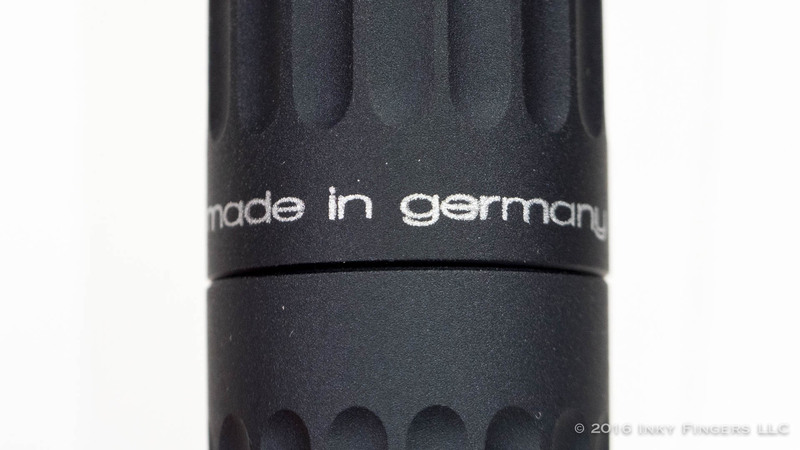 The section comes off on very smooth threads to access the standard international cartridge or converters. 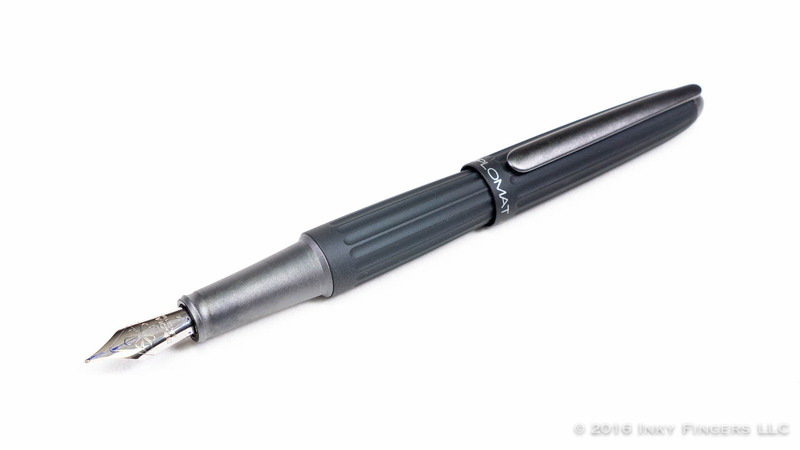 Design-wise, I love the look of this pen. It comes in both black/grey, matte brown, and matte silver. 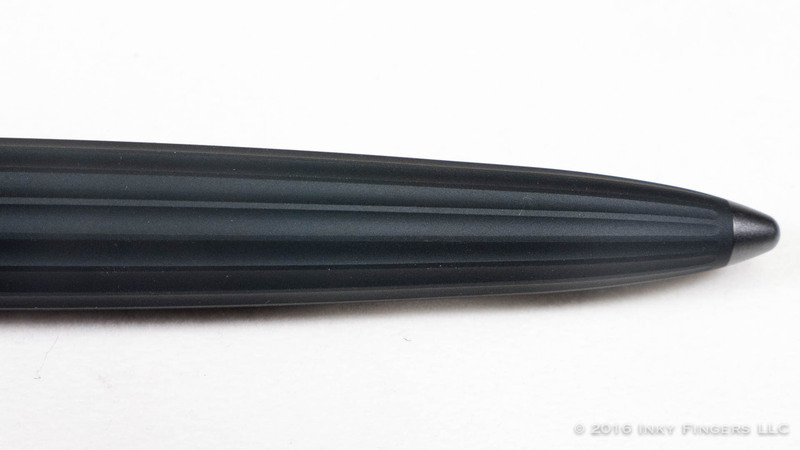 The black, almost stealth, finish is beautiful, but I find myself being continually drawn back to the brown version of this pen. 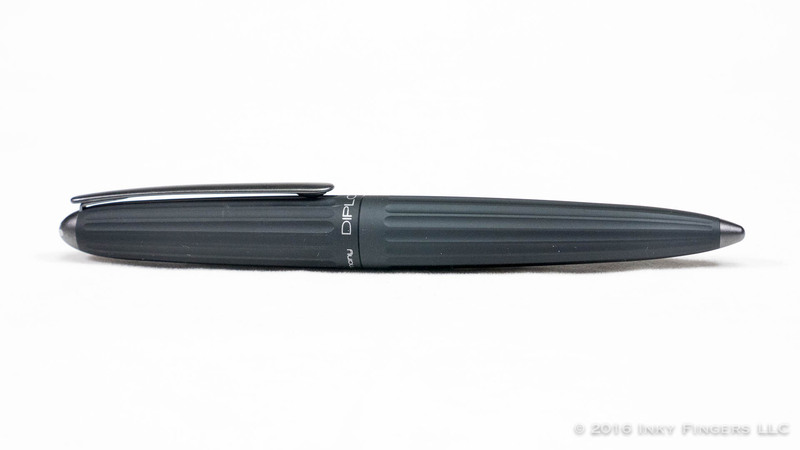 (For many reasons, not least of which is that I don’t have very few brown pens in my collection and this one looks like chocolate.) 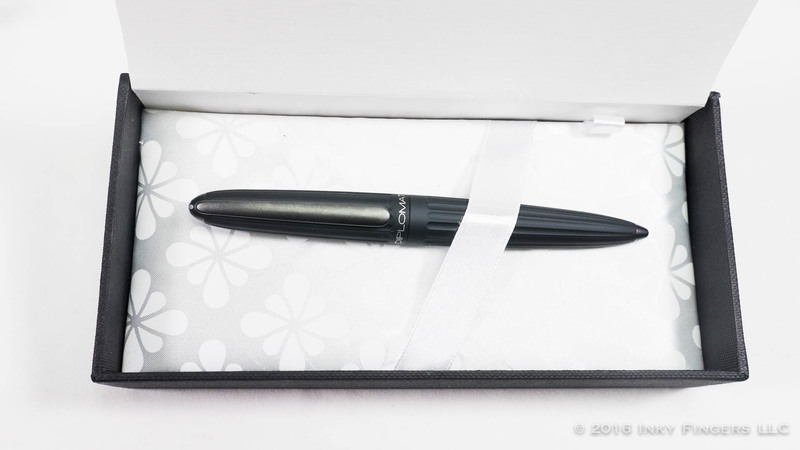 The construction of the pen is very high quality, very precise. It feels solidly made; like it could stand up to some serious abuse. 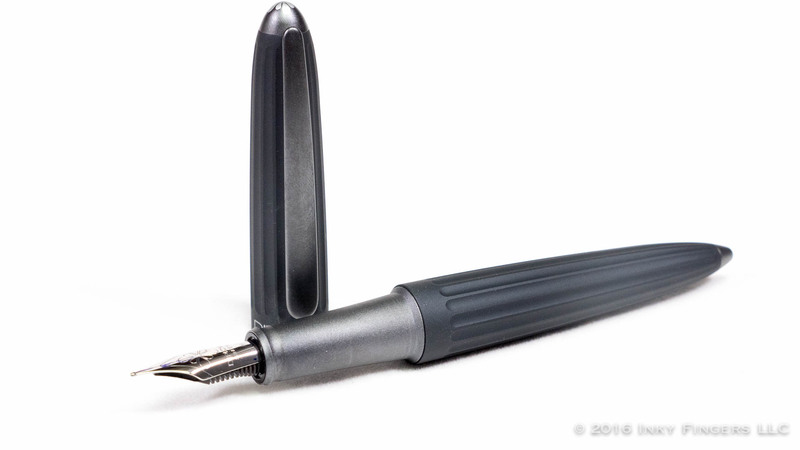 In the hand, this pen is surprisingly comfortable. 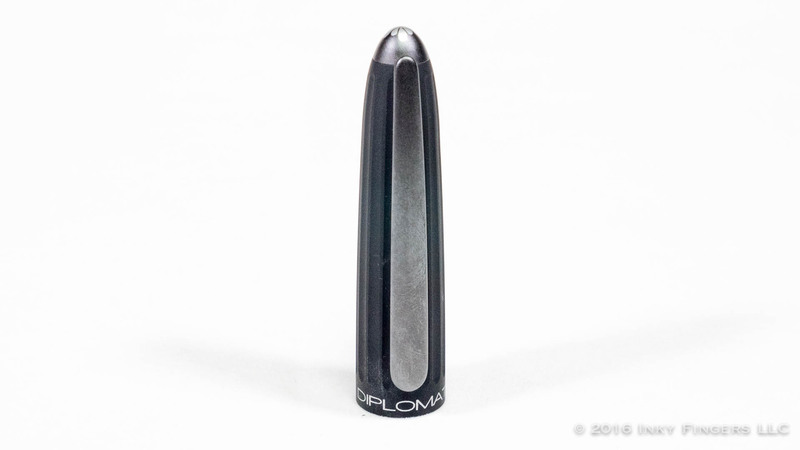 The all-aluminum body is lighter than you might expect, and the swelling shape of the barrel puts the weight balance in precisely the right spot. 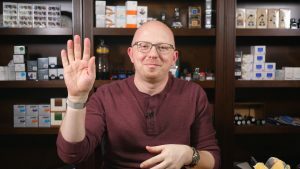 It is long enough to be used without posting, but it is sized nicely to bridge the gap between the larger and smaller hands. And while there is a step down from section to barrel, the long section and lack of threads make for a very comfortable grip. 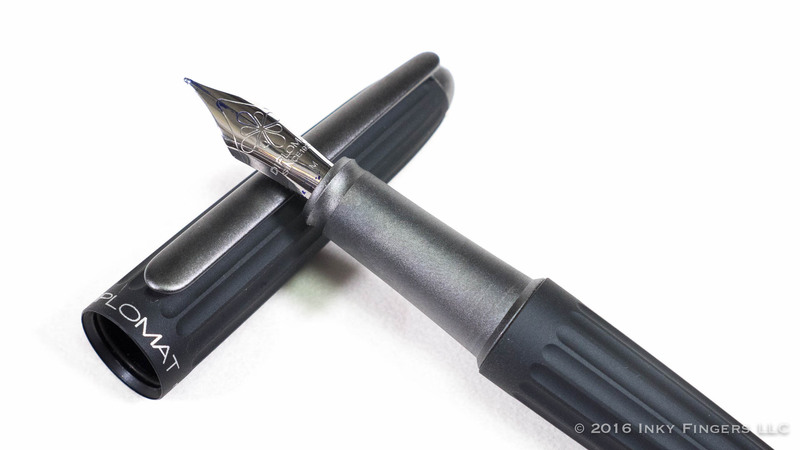 For you posters, the cap does post deeply, although only moderately securely. The deeper posting means that the pen doesn’t feel unbalanced or too long. 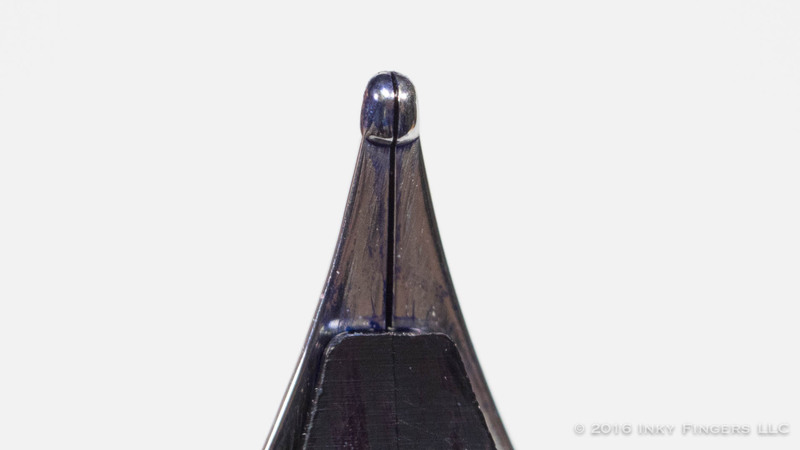 If I were a pen-poster, this is a pen I would enjoy using posted. 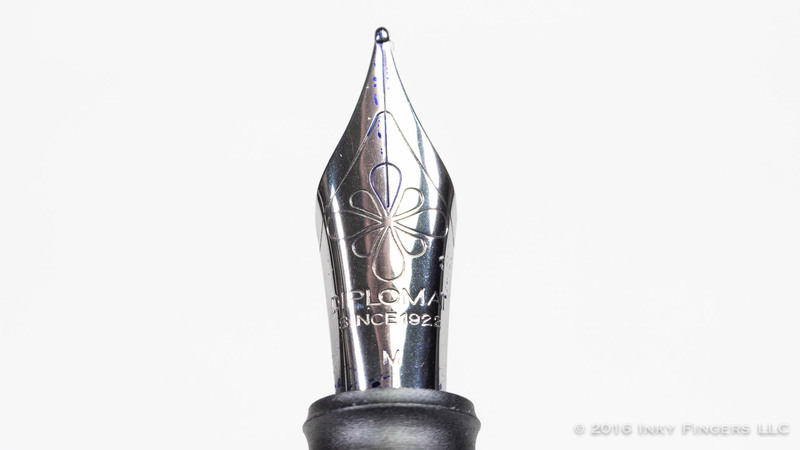 Diplomat has managed to do very, very good things with this nib. 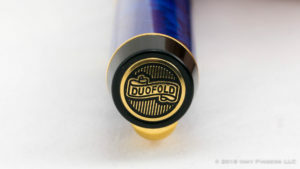 It is a touch on the dry side, but is beautifully tuned and quite smooth. (A 2 or a 2.5 on the Matt Armstrong feedback scale). The feed seems capable of keeping up with long writing sessions with only the barest hint of ink starvation. 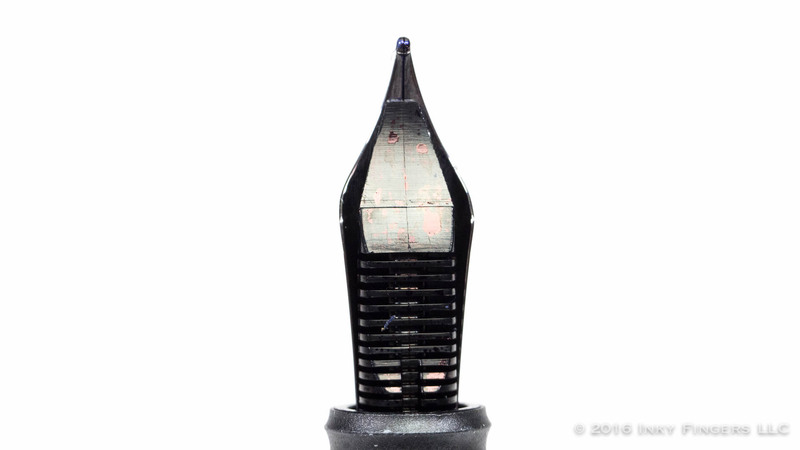 This nib is easily in the top five steel nibs I have ever used, and blows a lot of gold nibs out of the water too.